Enjoy a meal at the restaurant, or stay in and take advantage of the hotel's room service (during limited hours). Wrap up your day with a drink at the bar/lounge. Full breakfasts are available for a fee. Located in Meridian, Hilton Garden Inn Meridian is within a 5-minute drive of Bonita Lakes Park and Bonita Lakes Mall. This hotel is 1.7 mi (2.8 km) from Mississippi Industrial Heritage Museum and 2.1 mi (3.4 km) from Temple Theater for the Performing Arts. 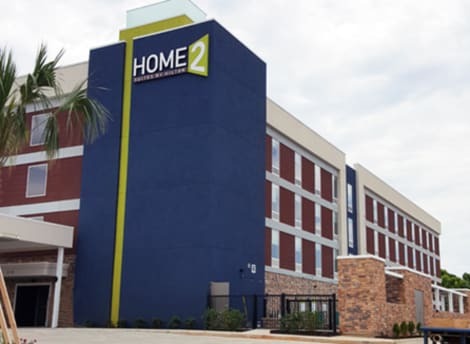 Make Home2 Suites by Hilton Meridian, MS your home away from home. Ideally located near shopping and dining, the hotel is just outside the city center, across from Bonita Lakes Mall. Make sure to stop by the Front Desk for some useful tips on things to do near our pet-friendly hotel. Settle into your spacious studio or one-bedroom suite and customize your space to suit you. The Working Wall - that's the full kitchen, work area and storage - features movable furniture. Kick back on the sleeper sofa and watch a show on the flat-screen HDTV. Each room features complimentary WiFi and a work desk with an ergonomic chair.Jump-start each day with free breakfast at the Inspired Table ™. If you’re in a hurry, pick up a snack from the Home2 MKT convenience store which also sells other travel essentials. Take a dip in the outdoor saline pool or exercise in the Spin2Cycle facility, where you can run a load of laundry and exercise at the same time. Our hotel also features a business center where you can access computers, printing and fax capabilities. Host your next meeting for up to 50 guests at our hotel with flexible setup options.